Bounty Hunter Report 4-20. Over 350 bounties reached. Check out how bounties work here with this link . There are tutorials in various languages. We changed the table a bit. Let us know if this is better or worse than before. We are currently trying to update this report every other day. 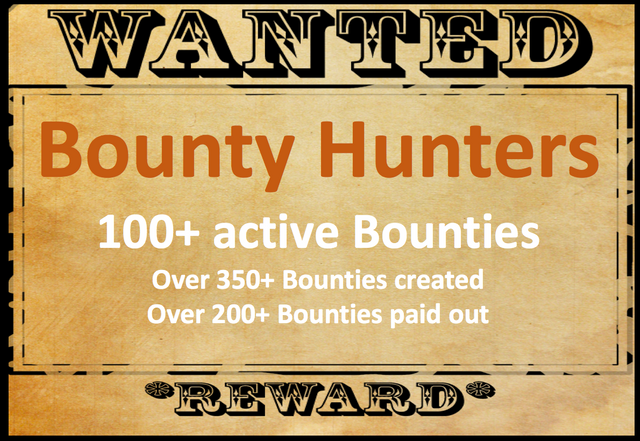 Given that bounties run 7 days mostly this should be a good frequency and balance between spam and giving everyone a chance to participate in each bounty. Minimum bounty size we will include in this report to 0.1 STEEM or SBD. Bounties are free to create at this time, but we do plan to come up with some form of fee/reward sharing model in the future. We are making good process with the website. We expect to have a beta version out within 4-6 weeks. Over 350 bounties created, over 200 paid out around 85 active. Thank you for everyone trying them out. The rate of new bounties has slowed down a bit, which is ok by us. We have also not promoted the bounties much. We will start more awareness campaigns when the website is up. Since there is no easy way to search for bounty posts, we will create these lists of bounties on a regular basis, so make sure to follow the @steem-bounty account. When our website is ready this will much better. Some posters use the "bounty" and "steem-bounty" tag, so you can look for those as well. If you create a post an plan to use a bounty, make sure to add a bounty tag and ideally announce in your post or via the headline that you are providing a bounty. Remember in order to qualify for a bounty reward you must write a comment to the bounty post, which needs to be a top level comment (direct response to the post). is there an easy way to search for the bounty and steem-bounty tags? or do you just have to manually look for them. i was just asking someone about this earlier today. Yea currently that is all u can do, besinders following this report. This will all be easier once the website is up. @steem-bounty! May I know why my last bounty was not paid even after the post paid out a couple of days back? Thx, for letting us know! We will take a look at it. Sorry for my response time I am traveling currently. It's okay, nothing so urgent here. Take your time. We have already incorporated a way to manually pay out bounties for our next version. We are checking if we can trigger it for this one. If not I will have to refund you. Sorry I will keep you posted. I believe this has happened twice and may have happened during API connection failures. Check the post, the bounty is paid out now. I've a suggestion to exclude self-upvotes from the share in community upvotes.